You gals have some slipcover talent…this is not even the half of it. Thank you so much for all your support and love! I appreciate all of you so much and LOVE seeing you make your old furniture new again…by slipping it. It thrills me! Have a Happy and Safe New Year! Love them all, especially the monogramed 'S' one! Happy New Year!! So many lovely slips. Thank you for sharing your talent. 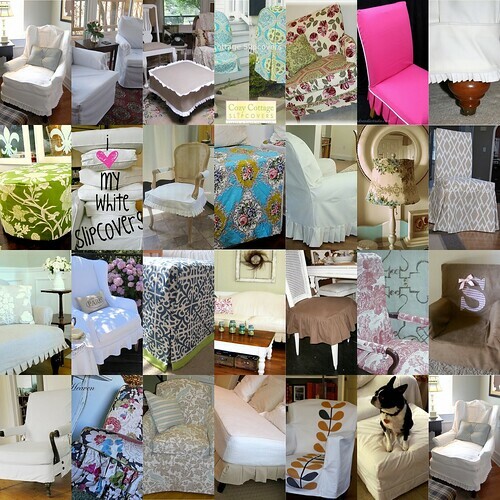 I am inspired to tackle a slipcover in the new year, thanks to you. All of these slipcovers are gorgeous. I am so inspired to slipcover everything in my house now:) Happy New Year to you! Wow those are great! I hope you had a lovely Christmas! Happy New Years! Here’s to a fabulous new year! Happy New Year! I'm so honored !! What an adorable little Boston Terrier 😉 Thanks Kristi for all you do! Happy 2011!